Over the last three years, the Coyote Building has been transformed with major brickwork repair, all new windows, and a flagpole and the Robey Hotel flag atop the building’s cupola. Along with the hotel, the building includes a hostel called the Hollander, three restaurants, two bars, and a small rooftop pool. Search results for "Goettsch Partners"
Apparently, Chicago has an insatiable hunger for boutique hotels in vintage Chicago skyscrapers. In 2015, the newly renovated downtown Chicago Athletic Association (CAA) became the go-to hang-out for architects during the Chicago Architecture Biennial. Virgin opened anew hotel in the 1928 Old Dearborn Bank Building; Goettsch Partners has completed the LondonHouse Hotel in the 1923 London Guarantee Building; and the 1928 Chicago Motor Club, the 1929 Carbon and Carbide Building, and the Burnham and Root–designed 1895 Reliance building have been converted into a Hampton Inn, a Hard Rock Hotel, and Kimpton Burnham Hotel, respectively. Now, another “new hotel, old building” is opening outside of this downtown cluster, to much fanfare. The Robey hotel, named after the historic street name of what is today Damen Avenue, is located at the major intersection of Damen Avenue, North Avenue, and Milwaukee Avenue, an area called Six Points in Wicker Park. Located in a 1929 building officially known as the Northwest Tower, and more locally known as the Coyote Building, the 12-story art deco tower is the tallest building by far in the neighborhood. It is a local icon, and for decades it was the center of an annual arts festival called Around the Coyote. In the more recent past, however, the tower has laid largely empty, often on the verge of bankruptcy. Over the last three years, the Coyote Building has been transformed with major brickwork repair, all new windows, and a flagpole and Robey flag atop the building’s cupola. Chicago-based Antunovich Associates was the architect of record on the project, with design work by Brussels offices Nicolas Schuybroek Architects and Marc Merckx Interiors. The hotel is being managed by the Mexican hoteliers Grupo Habita. Along with the hotel, the building includes a hostel called the Hollander, three restaurants, two bars, and a small rooftop pool. The hotel itself has 69 rooms, including rooms in the sharp southeast corner with unblocked views of downtown, three miles away. The rooftop Cabana Club bar and restaurant on the roof also offers panoramic views of the city. When the Northwest Tower was designed by Perkins, Chatten & Hammond in the 1920s, it was one of the first towers outside of Chicago’s downtown. Since then, it has remained one of the tallest to not be in the city’s center or along the lakefront. Though a handful of slightly shorter transit-oriented developments are popping up in the Robey’s vicinity, it is unlikely that it will lose its status as an icon of the near northwest side. 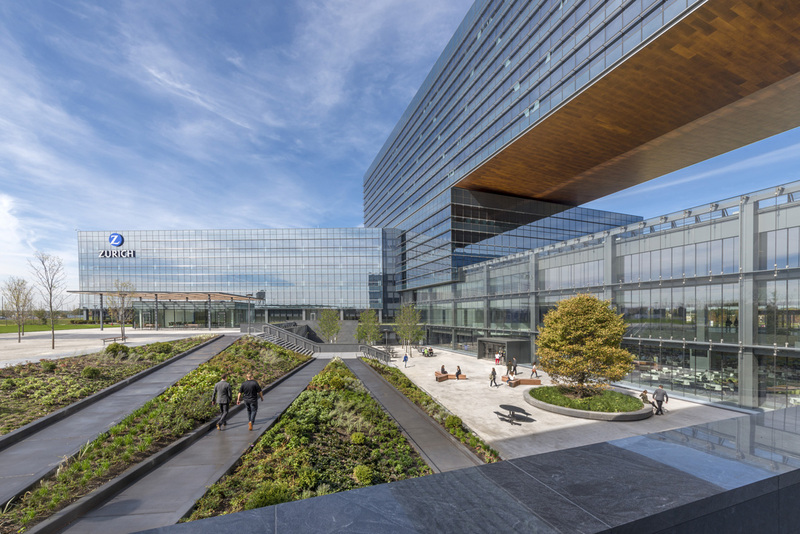 Chicago architects Goettsch Partners, along with Clayco and Thornton Tomasetti, among others, have achieved U.S. Green Building Council LEED Platinum certification on a new North American headquarters for Zurich Insurance. 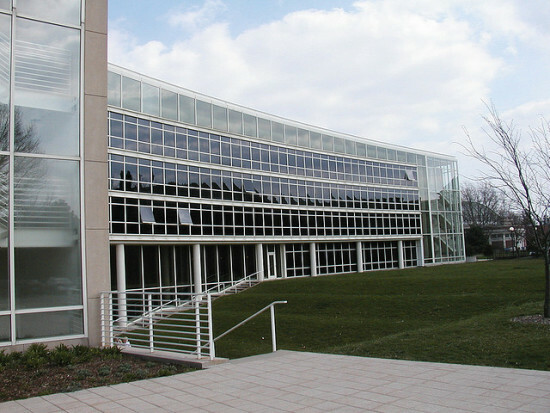 The campus, located in suburban Chicago is the largest LEED Platinum Core and Shell v2009 project in the U.S. and the only LEED Platinum CS v2009 project in Illinois. The building achieves a 62.7 percent whole-building energy cost savings, making use of multiple green roofs, energy efficient technologies, rainwater harvest and re-use, accommodations for electric and low-emitting vehicles, and native landscaping with more than 600 trees on 40 acres. The building is composed of three primary “bars” stacked and arranged to maximize views of the surrounding landscape and optimize solar orientation. The composition is benchmarked off the top volume, which was rotated 22-degrees. Paul De Santis, principal of Goettsch Partners, said this calculated move aligns the building with downtown Chicago, over 30 miles away. "The idea that you are in the suburbs but have a visual connection to the city resonated with Zurich's leaders." The lower bar on the east side of the campus is set 90-degrees off of the top bar, which helps to deflect northern winds and buffers sound from a nearby highway. Its rotation allows for direct sun in the courtyard near midday, promoting outdoor campus usage during the lunch hour. The curtain wall facade wraps outboard of three super scale trusses that are set 60 feet on center, achieving an 180-foot span over the middle of the campus, and a 30-foot cantilever at the perimeter. 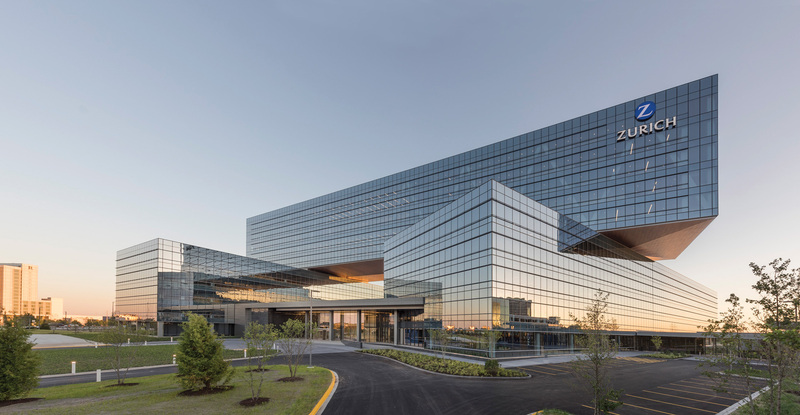 Michael Pulaski, vice president of Thornton Tomasetti, said that their team fine-tuned the glazing characteristics on the building, and custom designed a shading system that reduces peak gains and optimized daylighting. Detailed daylighting studies, using parametric software like Honeybee, were used to evaluate the effects of automated interior blinds and fine-tune the depth of the exterior shading devices for each orientation. The analysis optimized the depth of the shades for energy performance, which reduced peak solar gain for better thermal comfort and the size of the mechanical systems. De Santis said that in addition to this significant work to manage electricity usage, the management of water on site helped the project achieve its LEED Platinum rating. To push the project from a gold to platinum rating, De Santis said, "it comes down to two things: energy and water." The project team also incorporated features such as 1 acre of green roofs, native planting strategies, and large water retention areas for landscaping irrigation. The most advanced facade assembly occurs along the glazed south-facing wall of a three-story cafeteria where a ventilated double-wall facade was specified. Here, to verify performance and optimize the façade for reduced energy consumption, Thornton Tomasetti provided computational fluid dynamics (CFD) modeling. The 4.5-foot-wide double wall with integrated shades is designed to reduce solar gains in summer, while increasing the gains in the winter, as well as to improve daylighting, resulting in an estimated 33 percent energy savings in the adjacent space. Elsewhere, a single low-e coating on the number two surface (inner side of the exterior layer) continues through the insulated spandrel panels to produce a more uniform aesthetic while helping to minimize solar heat gain. The ground floor features a more transparent recessed glass, which De Santis said was an aesthetic and compositional move to help the upper floors read as "floating" volumes. With approximately 2,400 employees moved into the facility, the campus was designed to accommodate up to 2,800 employees. De Santis said the two lower bars are designed to extend an additional 100-linear-feet if and when more space is needed in the future: "It's very rare to work on a 26-acre site. We're used to working in very urban conditions. So the idea that the land allows for some of these growth strategies is very natural for the project. The longer these bars get, the more elegant the architectural expression will be." Chicago’s north suburbs are exactly as one might expect: sprawling malls, endless subdivisions, business parks, and miles of highways. In short, it’s not where one would expect to find notable architecture. Yet just across the highway from an imposing blue Ikea stands a new corporate headquarters unlike the surrounding tedium. The new Goettsch Partners–designed 784,000-square-foot Zurich Insurance Group North American headquarters is a formally ambitious exercise in large-office design. For most, the Zurich headquarters will be experienced from a speeding car racing by on Interstate-90, which passes just west of the site. Others may have the pleasure of seeing it while stuck in gridlock traffic on that same stretch. In either case, the design team at Goettsch Partners was thinking about the project’s presentation to the car-bound masses. The form of the building is clear, even at high speeds. A massive bridging bar straddles two other large glassy bars. In many ways the project is reminiscent of what is often considered a Dutch style of diagram-driven design, rarely seen in Chicago. It was only a matter of time before one of Chicago’s larger offices would bring the technique to a major local project. The project’s bridging super-truss also brings to mind the work of offices like OMA and MVRDV, which have used the inhabitable structural system to great effect for decades. Yet the simple formal move is in some ways very Chicago—it recalls the modernist monoliths of Downtown. The project’s glossy curtain wall gives the project that blue glassy sheen so prevalent in many of the towers currently rising in the city. The company’s name is also carefully integrated into the facade in large letters, another aspect that seems to be a conversation surrounding so many Chicago projects, old and new. Employees and visitors drive through a lush landscape designed by Chicago-based Hoerr Schaudt Landscape Architects, complete with walking and biking trails, water features, and rolling native savannas. Included in the landscape is a memorial to four employees lost in the September 11th terrorist attacks, and at its center is a large tree that was moved from the company’s former headquarters a mile away. Other more specifically landscaped areas include a sunken hardscape close to the building, where waterfalls seclude the area from the nearby traffic. A small pavilion in a Tuileries-inspired treescape gives employees another space to get out of the building for formal and informal events. What is missing from much of the landscape is an element that usually defines similar large corporate campuses: surface parking. Though there are a handful of spots near the building’s entrance, most of the parking is consolidated into a multilevel parking garage whose form echoes the building—two bars clad in screening conceal the employee parking. The building’s entry sequence starts in this parking structure, with the understanding that it would be the main entry for the vast majority of workers. Leading from the parking into the building, a long, wide, bright corridor provides protection from the intense winter winds and snow. Working closely with Goettsch Partners, local office Cannon Design handled the interiors. Typifying a restrained palette, the interior feels appropriate for a major corporate office-scape, with a few twists. Rather than completely relying on the latest trade journal theories about office culture or attempting to tap into popular, but possibly fleeting, trends, the design was based on extensive research done directly with Zurich employees. Zurich, a major insurance company, was intent on providing a productive yet comfortable space for the 3,000 employees who would be working in the building. In a series of fully functional workspaces, dozens of employees rotated through different layouts and work environments, spending weeks in each. The feedback from this study was integrated into the overall concepts behind the interior. A main finding was that workers wanted to have a variety of choices when it came to their individual workspaces. Every desk is sit-stand and other spaces throughout the building are set up to become impromptu work areas. Cafes, quiet alcoves, and larger common areas are all equipped with furniture and power to allow for work to happen away from the typical workspace. Desks are grouped into smaller “neighborhoods”of around 30 desks in separate areas, rather than an endless expanse of cubicles. The bars that make up the building are only about 100 feet wide, and many areas include double height spaces, so access to natural light is never far away. Solar gain from all of that glass is mitigated by a discrete louver system on the exterior and operable shading on the interior. For the building’s largest space, a common area for large gatherings, a 300-foot-long double-skin glass wall was engineered by Thorton Thomasetti to passively vent warm air out of the building before overheating the interior. These natural lighting systems play an important role in helping the project achieve a LEED Platinum certification, making it one of the largest buildings in the world to achieve this designation. Water and energy reduction technologies were also integrated into the design. The landscape design contributes with over 635 trees being planted across nearly 30 acres of softscape. The orientation of the top bar of the building is made strikingly clear when standing on the downtown-facing balcony on the top floor. This balcony, well above the suburban landscape before it, makes for a perfect summation of the project as a whole. While maintaining the openness allowed by its position out of the city, it still aspires to the quality and formal ambitions of those towers on the horizon. While the project would fit in well in the outskirts of a city like Copenhagen or Amsterdam, where similar formally experimental buildings are becoming commonplace, in the Chicago suburbs it is honestly a bit shocking—in a good way. 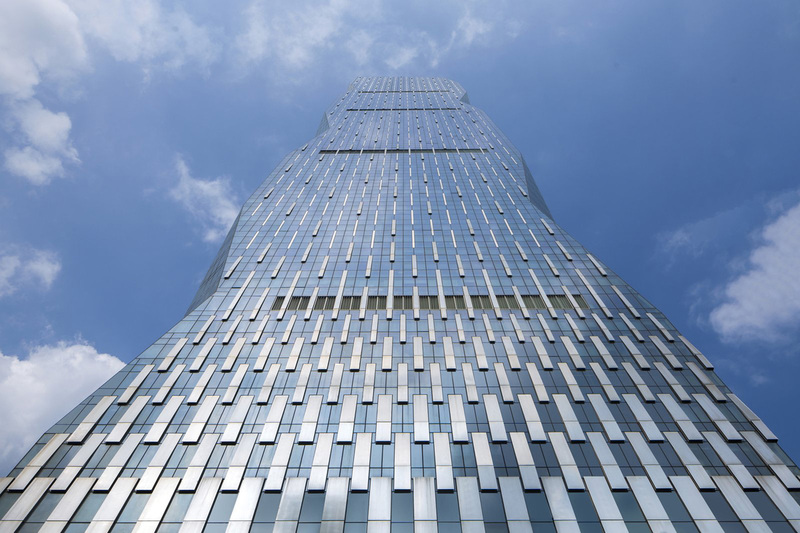 A nearly 1,000-foot, mixed-use tower was recently completed in Guangzhou, the third largest Chinese city behind Beijing and Shanghai, about 75 miles northwest of Hong Kong. This is the third project that Chinese-based R&F Properties has developed with Chicago-based architect Goettsch Partners. The building, named R&F Yingkai Square, benefits from a masterplan that is almost fully realized—to date— and involves planned gardens, cultural space, museums, and mixed-use towers. Paul De Santis, principal of Goettsch Partners, said the Pearl River area of Guangzhou was envisioned 15 to 20 years ago, and is nearly complete today. “In China, the context often changes too rapidly to formally respond, but the government was very committed to this particular master plan. It gave us an opportunity to be contextually sensitive." Facade Manufacturer Sanxin Facade Technology Ltd. Facade Installer Sanxin Facade Technology Ltd.
Angular canted corner walls break up the massing of the otherwise boxy tower, providing specific views out into the city. While the northwest corner provides good views 250 feet above neighboring buildings, the northeast corner is best viewed only 100-feet high. This led to a “syncopation,” as De Santis called it, in the location of the 8- to 10-story chamfered corners. He said other view corridors into the cityscape can improve or get worse depending on height. "We use the corner carves to not only architecturally call out the mixed use stacking of the building but also highlight those signature moments." A nearly 14-foot-high reinforced concrete floor-to-floor spacing accommodates a 10-foot clear ceiling. The exterior wall is a unitized curtain wall system. Operable ventilation for occupant comfort is incorporated into the system. The glass is an insulated low-e assembly with an aluminum mullion system. A lot of energy was put into the detailing of the corner units, which are also unitized, but consist of three layers of laminated fritted glazing for added structural and aesthetic benefits. To address both daytime and nighttime lighting conditions, the frit is two-sided: white on the outside, dark on the inside. At nighttime, the glass can be "grazed" by LED's which allows for the building to be illuminated to the exterior without introducing light to the interior space. During the day, the dark frit from the interior is nearly imperceptible when looking outward to the exterior. A gradient of panelized stainless steel panels tapers into the curtain wall glazing. The architects say this composition is an expression of the gravitational quality of the tower and a response to the stacked program of the building. By utilizing opaque panels at the base of the tower, the shell of the building is responsive to a connective infrastructure of bridges and tunnels tapping into the building to support retail use. With office and hotel uses above, the panels give way to transparent view glass. The bulk of the building is dedicated to office use, organized into four zones. Situated within the office is a "sky lobby" for the office users. The Park Hyatt occupies nine floors above the offices, and the tower is capped off with hotel amenities such as a pool, lobby, lounges, three restaurants, and an outdoor terrace 300m off the ground. As stainless panels taper in width, their height and vertical spacing remains constant. Horizontal coursings slightly overlap at spandrel panels, which assume a unique, but repetitive, geometry. The composition allows for a more standardized view glass unit on each floor and De Santis assures us on the logic behind the facades panelization: "It looks more complicated visually than it actually is." One primary dimensional restraint was set by the glass manufacturer who limited a panel width to 600 mm, or around 24 inches, due to manufacturing processes. The final massing of the building was designed iteratively by incorporating a rigorous approach to wall modulation, accommodating glass manufacturing dimensional requirements to produce a "final" geometry of chamfered corners. The architects integrated lighting into the facade assembly in response to what they consider a cultural norm in tall Chinese construction projects. De Santis said, “Our number one goal was to try to manage light pollution—a serious issue in the city.” To combat this, the architects located LEDs behind stainless steel panels which cant outward as they taper up the building into thin vertical strips. This provides a subtle indirect lighting element without exposing the source. The architects went with this approach to avoid having to flood light or uplight the tower with harsh lighting. The LED's are programmable and can be syncopated, change colors, and dim to produce effects ranging from static to theatrical. De Santis says the ability of this project to cater to both a pedestrian and urban scale is particularly successful, and a good learning lesson for future tower projects. "The sense of intimacy we were able to achieve for the arrival sequence of the hotel. 300-meter (984-foot) tall towers have a big impact on your surroundings, and to get a level of intimacy means that you are able to incorporate an interesting level of detail and material selections. The feel of the space is anything but cold and austere, which is often the case in large tower buildings." De Santis explains the Hyatt hotel brand prides itself on this level of intimacy. “It's less about grand ballrooms and lobby spaces, and more about producing warmth and a human scale.” This triggered a change of material at the hotel drop off point. A dark anodized steel and Chinese screens in the ceiling pair with a simple natural stone that washes the entire space in a natural, light-toned coloration. This provides a backdrop for sculptural artwork and provides the basis for unique multi-story spaces "carved" into the tower in the upper floor lobby and lounge spaces. De Santis concludes, “Your tower can have an expression. You can create an intimate environment without losing the expression of its urban gesture." Among Chicago architects, the Monadnock Building is an icon. The tower is a product of the Chicago School, half designed by Burnham and Root and half by Holabird & Roche, built in two phases. Yet it is unlike any of its contemporaries. To start, its older southern Burnham & Root half is a masonry structure, the tallest in the world. And though the southern half, built three years later, is a more typical steel structure, the similarities to other 1890s Chicago buildings end there. Notably, rather than the ubiquitous center atrium of most Chicago School builds, the Monadnock has a thin interior pedestrian street, complete with old-timey shops. The upper floors of pint-sized offices are mostly filled with attorneys and the occasional private detective, yet a few small architecture firms have set up shop in this enigmatic structure. Among the half dozen or so practices in the building, an even smaller contingent is in their first official office spaces. For them, the move from the dining room table to a downtown high-rise was an important step in establishing their practice in the city. An added benefit has been the growing community of critical practices under one roof. Norman Kelley and Design With Company share a small office on the 12th floor, with just enough room for each to have an intern or two at any given time. Three stories below, PORT Urbanism makes epic master plans in a 300-square-foot office. The highly experimental Weathers and MANA Design/Protostudio also call the building home. Having an office in the 125-year-old Monadnock is not without its drawbacks, though. The depth of the offices is governed by the distance from the central hall to the building’s envelope, only around 15 feet. Though affordable, the often-tiny offices leave very little space for producing. MANA Design/Protostudio and Weathers find themselves limited by space, unable to produce the models and prototypes with which they often work. To deal with the lack of space, the offices rely on connections they have to universities, shared spaces, and a series of specialized fabricators. Design With Company often calls upon stage-scene fabricators to build installation pieces, as it has found scene builders to be more accustomed to the scale and precision the models demand. Some of the unique benefits of the building include operable wood-frame windows and classic hand-painted doors straight out of a film noir. Each of these firms flies steadily under the radar in a city dominated by many of the largest corporate firms in the world. Only a few blocks away, the Motorola Building, formerly the Santa Fe and Railway Exchange Building, is occupied by Skidmore, Owings & Merrill, Stantec, and Goettsch Partners. Despite its lower profile, the Monadnock crew has recently seen a great deal of critical and popular success. Norman Kelley was responsible for one of the Chicago Biennial’s most popular submissions, Chicago, How Do You See?, an expansive vinyl window treatment on the front of the Chicago Cultural Center. Its new Aesop skin care storefront has also garnered international attention. Along with its own contribution to the biennial, Design With Company was responsible for a playful forum-like installation at Design Miami for Airbnb. PORT’s projects tap into a very real idea of “make no small plans.” Its submission to the biennial, The Big Shift, raised ire among mainstream media critics, but thrilled visitors. Both Sean Lally, the head of Weathers, and Norman Kelley were recipients of the coveted Rome Prize, joining the likes of Richard Meier, Charles Moore, Michael Graves, and Stanley Tigerman. The more established KOO, also in the building, was recently given the go-ahead from the city to move forward with a new hotel on Navy Pier. The Monadnock represents the possibilities of Chicago architecture, from its original soaring masonry ambitions to some of today’s most experimental young practices. If there is an argument to be made about the power of space and adjacency, the Monadnock may just be the model to prove the point. Expect more exceptional things from this exceptional building. September 1st will mark the official launch of Architects Advocate Action on Climate Change. The group, composed of nearly 80 Chicago firms, has a mission of advocating for legislative action on climate change. Firms of all sizes have signed on as supporters, including Studio Gang Architects, John Ronan Architects, JGMA, Design with Company, Goettsch Partners, and UrbanLab, to name a few. Firms from related fields, such as engineers, architectural photographers, and videographers have also joined. The genesis of the project was initiated in the office of Chicago-based Krueck + Sexton Architects. The group positions itself between practice and policy: it will help shape legislative action with a united front. An Architects Advocate statement reads, “As architects dedicated to healthy and livable communities, and guided by scientific consensus and reason, we advocate for action on Climate Change.” The group will push for a healthy environment as a civil right. Though Architects Advocate's exact plan of action has not yet been released, supporters are encouraged to mark their participation with banners embedded in their websites. The group's web page also includes links to environmental advocacy resources including AIA Advocacy, Architecture 2030, and NASA. The launch of Architects Advocate coincides with the federal Council on Environmental Quality’s new guidelines for evaluating federal projects. These rules ask that any federal agency starting a project should quantify climate impact and consider alternative design solutions. “Indirect” emissions will also be included in understanding any project’s environmental impact. For example, building a new road may encourage more people to drive while replanting trees can reduce airborne carbon and erosion as well as provide wildlife habitat. The new guidelines are built on previous directives, including the 1969 National Environmental Policy Act (NEPA). Though some federal agencies have already been providing “Climate Impact Reports,” these new rules will help standardize and clarify a framework for climate action. 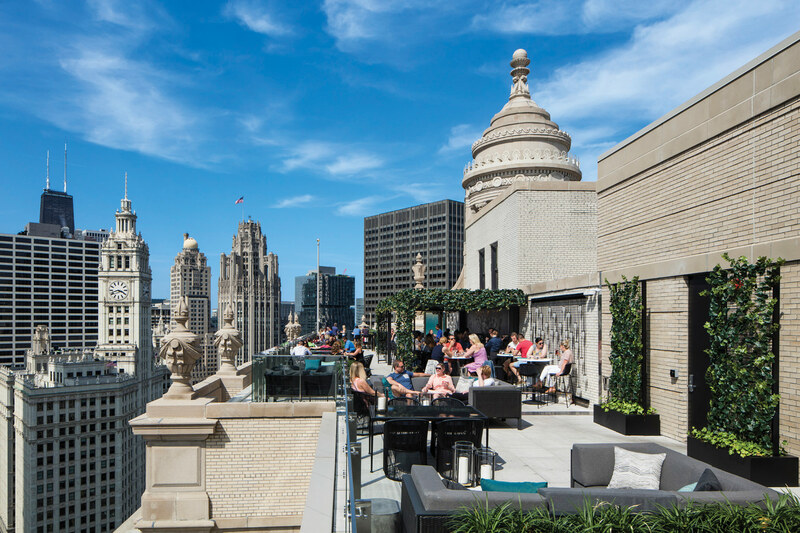 One of the best ways to experience Chicago is from a rooftop, so naturally hoteliers are cashing in. Case in point: The new Goettsch Partners-designed LondonHouse. Located at the corner of North Michigan Avenue and Wacker Drive, along the East Branch of the Chicago River, the 452-room hotel boosts a three-story penthouse bar and restaurant. The LondonHouse is a hybrid renovation-new-build with 183,000 of its total 250,000 square feet located in the historic Alfred Alschuler–designed 1923 London Guarantee Building. The remaining 67,000 square feet are in a narrow sliver of a building that finally completes Wacker’s streetwall, filling an odd 20-spot surface parking lot. This contemporary curtain-walled addition acts as the entry to the hotel with a second-floor lobby and restaurant, the Bridges Lobby Bar. The main draw of the hotel for guests and the public alike is the three-story LH bar and restaurant on the building’s roof. With infinitely Instagrammable views up and down the river, the scene is a veritable architect’s dream. 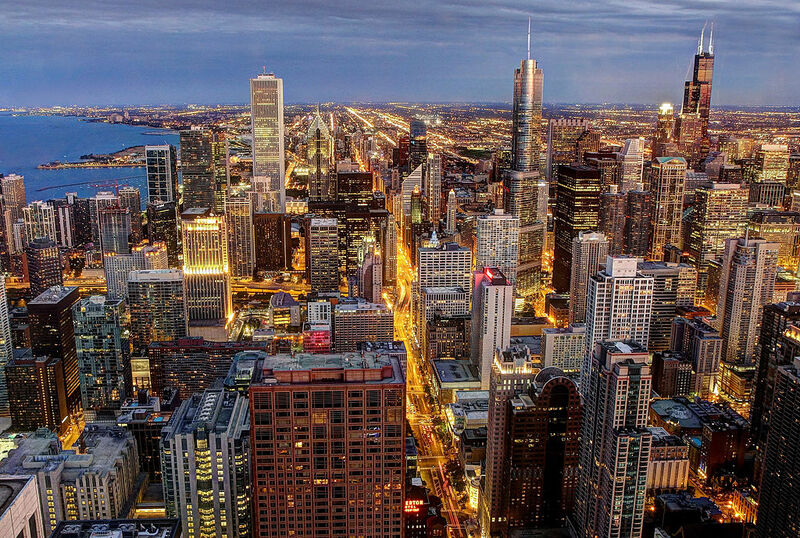 Directly across from the hotel sits no less than, Marina City, AMA Plaza (formerly IBM), the Trump Tower, the Wrigley Building, and the Tribune Tower. With special attention paid to the city’s landmarks codes, a cupola of the Guarantee Building has also been opened for events, accessible through LondonHouse. 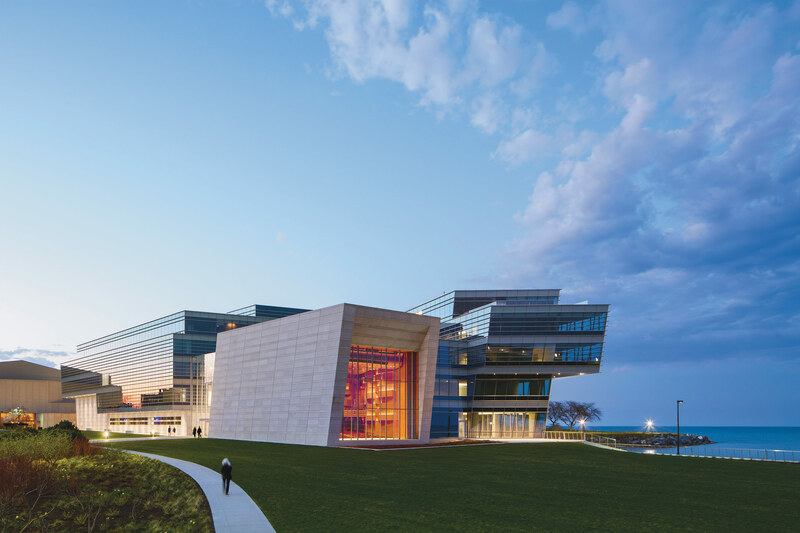 One might not think to travel to Evanston to get a view of the Chicago skyline, but thanks to a new Goettsch Partners–designed Northwestern University campus building, that has changed. The Patrick G. and Shirley W. Ryan Center for the Musical Arts, home of Northwestern’s Henry and Leigh Bienen School of Music, takes a transparent approach to the normally opaque music-school building typology. The result is a project that connects the far north side of campus all the way to downtown Chicago and Lake Michigan. The five-story, 152,000-square-foot glass form sits in stark contrast to the campus’s 1977 Walter Netsch–designed Regenstein Hall of Music. The older and much smaller Brutalist structure was the campus’s main music building. Instead of discarding the Regenstein, Goettsch worked to wrap the building and provide interior connections on all levels to incorporate the two projects into one greater whole. For the first time, to the delight of the school, the entire music department, all 650 students, can be housed under one roof. Nearly every space in the new building sits behind glass-curtain walls looking out over the water. This includes the classrooms, practice rooms, and even the main 400-seat recital hall. To achieve this, great care—and some inventive sound and material engineering—was needed to ensure the acoustically reflective glass would not compromise sound quality. In the case of the practice rooms, the goal was to isolate each room from its neighbor. To do this, walls, floors, and ceilings received fairly typical sound-insulating techniques, including use of extra drywall and sealed doors. The trick was to stop sound from leaking from room to room along the curtain wall. To do this, custom-designed transoms between panes were engineered to acoustically isolate each room. The result is spaces in which students can practice without the distraction of the tuba next door but with the advantage of full daylight and uninterrupted views of the lake stretching out below them. Though the practice rooms were given special attention, it is in the main recital hall where the project was able to really flex its acoustic-engineering muscle. The 400-seat Mary B. Galvin Recital Hall is an intimate wood-lined space with one thing that few performance spaces can boast: a stunning view. Thanks to a 40-by-42-foot low-iron curtain wall behind the stage, concertgoers are treated to a vista of the Chicago skyline 13 miles to the south. Even more so than in the practice rooms, sound quality was absolutely paramount in the design of the space. In collaboration with Kirkegaard Associates sound engineers, the window wall was designed as a novel double layer of glass calibrated to control sound quality. The outer layer is a more typical curtain wall, while the inner layer is slightly canted to avoid the audience hearing any sound echoing off of the glass. The air space between the layers acts as an insulating buffer to keep the exterior noise of the occasional speed boat or Coast Guard helicopter from ruining a concert. This space also allows for an operable fabric blackout sunshade to transform the layout and mediate solar gain, as the room is south facing. The undulating wood walls are designed to work with the canted glass wall to absorb even more errant sounds, and acoustic banners can be lowered from the ceiling to “tune” the space for each individual concert. The performance spaces were not the only ones to benefit from the project’s transparency. The main entry leads into a bright three-story glass atrium that passes completely through the building, from campus to the lakefront. Every classroom and office also has access to daylight. Even the 150-seat black-box opera theater, typically a space that would be devoid of daylight, has a full glass wall, which can be blacked out when needed. Goettsch worked with renowned New York–based environmental design consultant Atelier Ten to achieve LEED Gold certification for the project. Along with working as sound insulation, the double-skin glass technology used throughout the building has a positive effect on energy efficiency. Additionally, the building incorporates a gray-water system, a design intention sensitive to the building’s location on the lake. Ultimately, through sometimes unconventional means, the Ryan Center changes the way in which we expect music schools to look and perform. Not bound by small punch windows, practice rooms don’t have to be dark, uninviting spaces, while recitals can be set against the drama of an ever-active lake and a towering skyline. Resources: Curtain Wall Benson Industries, Inc.
Choral and Opera Woodwork Glenn Rieder, Inc. 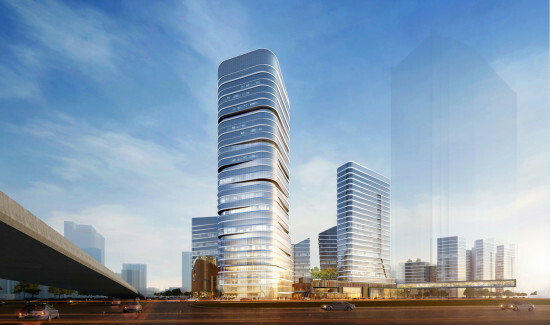 Designs by Chicago-based Goettsch Partners, along with Hong Kong-based Lead 8, have been chosen for a 2,841,672-square-foot, mixed-use complex in Shanghai. The Financial Street Shanghai Railway Station Mixed-Use Development is spread across two parcels of land just north of the Shanghai Rail Station. The project provides pedestrian routes connecting the project to adjacent sites and public transportation hubs with above and below grade paths and bridges. David Buffonge, cofounder and executive director of Lead 8 explained that “Financial Street Shanghai creates a sustainable urban environment that will concentrate walkable, compact densities around a vibrant mixed-use site near Shanghai Railway Station.” On the eastern parcel of the project, a 161,459-square-foot office building is accompanied by 484,375 square feet of loft apartments, and 161,458 square feet of retail space. The western parcel includes 1,410,072 square feet of office space, another 581,251 square feet of retail,236,806 square feet of loft apartment space, and a 53,819-square-foot cultural center. These programs are spread through five main buildings surrounded by shared public spaces and green retail streets. The office buildings also connect with the outdoors with indoor-outdoor work spaces, specifically tailored to appeal to technology and start-up companies. Both Goettsch and Lead 8 worked on the master plan for the project. Goettsch is leading the design on all the office and residential portions of the western parcel and the exterior design of the eastern parcel, while Lead 8 is handling all of the retail portions. Lead 8 is a young office founded in 2014. Their name, a partial acronym, stands for living environments, architecture and design. With offices in Hong Kong, Singapore and Kuala Lumpur, they focus on large-scale, mixed-use, and transit-oriented developments. With the recent opening of Ross Barney Architects’ public Riverwalk, Chicago is taking a much harder look at its “second shoreline.” Unlike the Lake Michigan public shoreline however, improvements to the riverbanks rely on developers, as most of the land is private. Unfortunately, since the city laid out its “Chicago River Corridor Design Guidelines and Standards” in 2005, there has been so little development along the river that only now is the city is getting a glimpse of its possible benefits. With the last two major projects along the rivers edge being the Trump Tower and 300 N. LaSalle, both finished in 2009, the city anxiously watches as private development along the river once again picks up. Now with three riverfront towers well under construction, and two more planned all around the convergence of the north, south, and main branches, the river is looking to be a much different place one year from now. Already in full form is bKL Architecture’s Wolf Point West tower. The 500-foot-tall, 48-story residential tower is the smallest structure in the master plan by Pelli Clarke Pelli Architects and includes two taller towers and an improved public river walk. With 510 units, ranging from studios to three bedroom apartments, the balcony-laden tower is destined to become highly sought-after housing stock. Positioned on a small piece of land jutting out into the river, views to and from the tower are uninterrupted from almost all directions. Substantial completion is planned for years end, and it is already becoming hard to remember, or believe, that there was once a flat parking lot on the site. Also occupying a former riverfront parking lot is the quickly rising Pickard Chilton-designed River Point tower at 444 W. Lake Street. Across the river from Wolf Point, the 730-foot-tall office tower sits on axis with the main branch of the river looking east. Bucking the recent trend of concrete towers in the city, River Point is a steel structure that finds its form in intersecting parabolic curves. “The curves are a response to the river and the train tracks that run below the building, as well as the building’s relationship to 333 Wacker across the river,” Pickard Chilton design principal and Chicago native, Anthony Markese said. With both Ogilvie and Union train stations directly to the south, the site sees some of the busiest train traffic in the city. Now thanks to the building’s new plinth covering the tracks, the public will soon be able to access the river in front of the building on the recently finished 1.5-acre riverfront plaza. Markese described the project as something of a “tower in a park, in the middle of the city.” The west side of the building, along Canal Street, will also have public programing, including a triple-height glazed lobby, retail space, and the entrance to a two story restaurant that will extend through the plinth to the river-side of the building. The city will not have to wait long see the final form of the building, as it is scheduled to top out before years end. 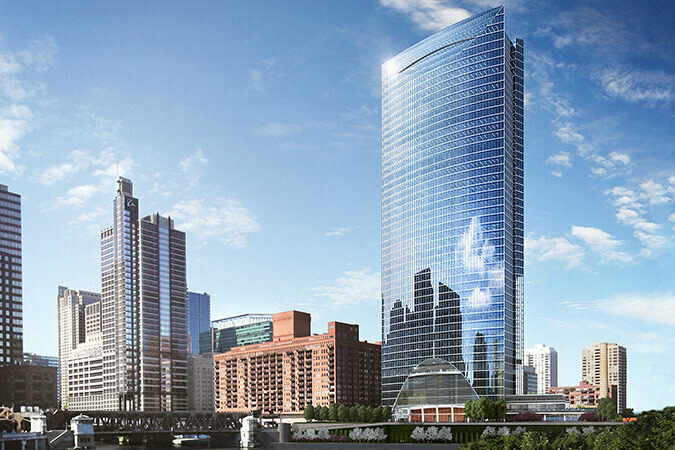 At 732 feet tall, the tallest of the three towers is the 150 N. Riverside Tower by Goettsch Partners, just to the south of River Point along the South branch of the river. Also a mostly-steel tower, Riverside comes down to the ground on an extremely slender site. Taken up mostly by the same rail tracks that traverse the River Point tower site, the lot has been vacant for nearly 50 years. Continuing with the theme of enhancing the river’s edge, a large green-roofed plinth will cap the tracks and hold a restaurant and public plaza. For the majority of the 51 stories, floor plates are cantilevered off of both sides of the elevator core to the east and west. In what will be possibly the largest of its kind, a 110-foot-tall glass fin wall will enclose the lobby on the west side of the building, sheltered under the cantilevering floorplates above. 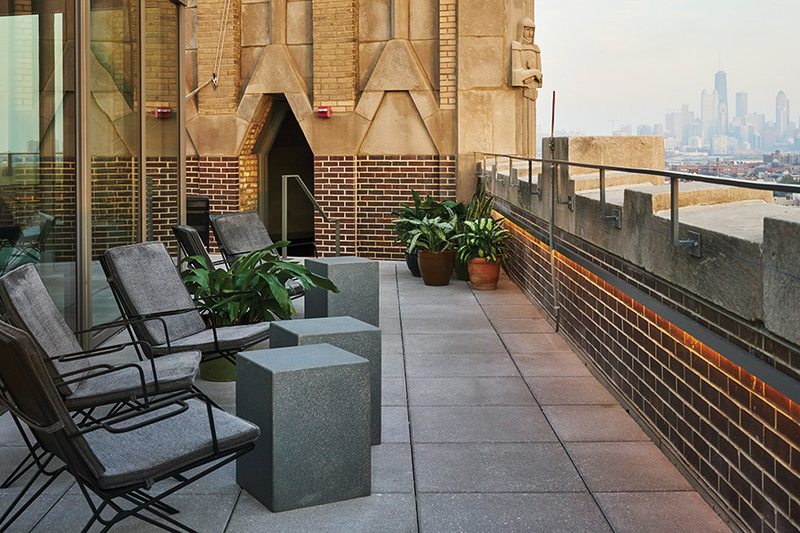 Besides the public outdoor space along the river and at the base of the tower, setbacks allow for private outdoor terraces at its upper levels. With no building allowed on the lakeshore, developers have finally seemed to realize that if they want to be near water, then the river is their best bet. With remediation underway to clean up the polluted water and extensive city-funded shore improvements, the river is quickly becoming the focus of the downtown. No longer are buildings turning their backs on the water, and more and more the public is being given easement across private plazas to get to its banks. With so much attention on the river, it is only a matter of time before people remember that the old symbol of Chicago, the circle inscribed Y found on so many public buildings and bridges, represents the branches of the river that were once so integral to the city. 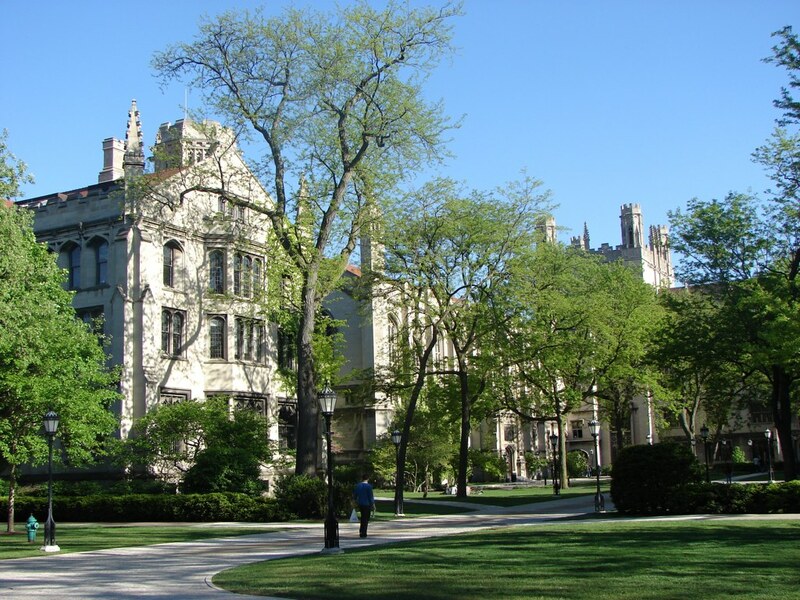 Among the Windy City's most well-known assets are its universities, from DePaul in Lincoln Park and the Loop to the University of Chicago in Hyde Park. Many of these campuses, in turn, are characterized by heavy brick and stone architecture in the Neo-Gothic style. The dominance of a single architectural style—a feature of many institutions of higher learning, not just Chicago's—presents a challenge to contemporary architects, who must combine a sensitivity to the existing campus fabric with the imperatives of contemporary college life. Perkins+Will's Temple Hoyne Buell Hall, University of Illinois, Champaign. (Eric Fredericks / Flickr) "Context is very important in our design," affirmed Perkins+Will design principal Bryan Schabel, who works on a variety of projects including educational buildings. "We pay particular attention to the massing of our buildings and their relationship to the existing conditions—whether it is an adjacent building, a path or road, or a court or quadrangle that we either want to enhance or create with our designs. Additionally, we try to take cues from the scale and materiality of the existing campus when we design." Next week, Schabel will participate in a panel on campus design at the Facades+ Chicago conference. His co-panelists include moderator William Menking (AN), Valerio Dewalt Train Associates' Joe Valerio, and Patrick Loughran of Goettsch Partners. As for cases where the existing architectural language and modern mandates come into conflict, an open mind is key. "Often times, some literal aspects of the context may be counter to the goals of the project," said Schabel. "The solidity of some historical campuses' contexts, for instance, may not achieve the daylighting goals we have in our contemporary buildings, so we may use the context in a more abstract way to relate the new and old." School administrators tend to support such an approach, he explained. "While we have had clients that wanted a more literal interpretation of their historic campuses, most of them have fortunately been in line with our ideas of modernity, as long as they still relate in scale with the overall experience of the campus," said Schabel. Hear more from Schabel, his co-panelists, and other movers and shakers in the world of facade design and fabrication at Facades+ Chicago November 5-6. Register today on the conference website. 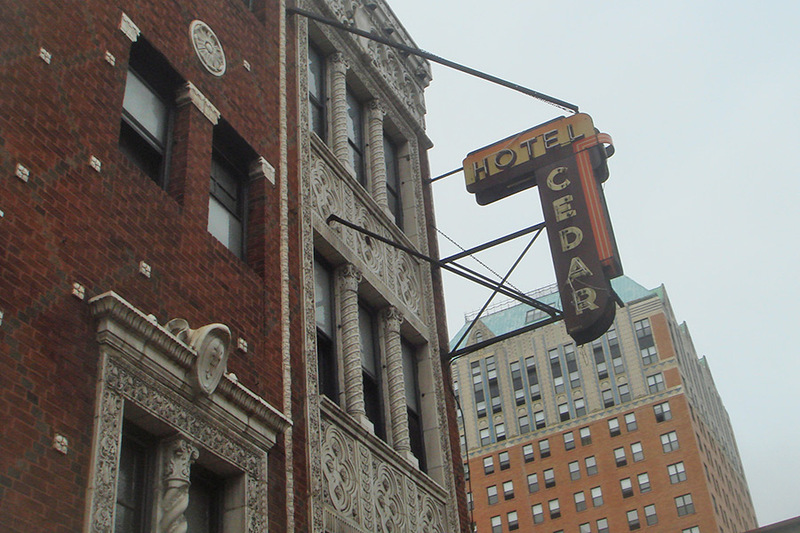 Like so many bygone transient dwellings in Chicago, the Cedar Hotel was once a prime destination for the down-and-out. But the Gold Coast address will soon serve a considerably more upmarket clientele. Following months of deliberations, the city recently approved the Viceroy Hotel Group’s proposal to build a 180-key boutique hotel on the site of the former Cedar Hotel at 1118 N. State St. Adding to its extensive list of properties in places like Abu Dhabi, New York and Miami, Viceroy’s plans for the glass and aluminum development reflects the firm’s belief that the Near North Side will continue “gaining momentum as one of the most sought-after modern luxury destinations in the city,” according to a press release. Built in 1924, the Cedar is listed as orange-rated in the city’s Historic Resources Survey, which notes the building’s “historic significance in the context of the community.” The team plans to demolish the inside of the building but maintain most of the Cedar’s brick and terra cotta facade facing the street. The proposal does not include plans for additional parking in or around the site. Viceroy signed on with local developer Convexity Properties, architect Goettsch Partners and designer TAL Studio to round out the vision for the rehab of the 18-story property. The team is expected to incorporate the Cedar’s facade into the redevelopment. A spokesperson for Viceroy declined to comment or present renderings of the project at this time, but renderings obtained from the city’s planning department offer etchings of a modern, if somewhat conservative tower set atop the exterior of the vintage hotel. The project, set for completion in 2017, will put Viceroy among a growing set of hospitality brands that have recently laid roots in the city’s downtown. Virgin Hotels and Hyatt Centric put the finishing touches on Loop-area boutique hotels earlier this year, and LondonHouse has announced plans to set up shop in the London Guarantee & Accident building next year. Currently housing a patio bar set across the street from so-called “Viagra Triangle” park, the underused Cedar site has been the target of redevelopment plans since 2007, but a poor construction climate and resident pushback has helped stall the project until now. Couched among pricey restaurants, designer clothing outlets and the offices of numerous plastic surgeons, the 4-story Cedar, which in its heyday served as a single room occupancy hotel, appeared out of place long before it closed in the mid-2000s. The new hotel won’t be the first in Chicago to bear the Viceroy name: that honor belongs to the original Viceroy Hotel, an SRO located near Union Park. Jetsetters need not worry about mixing up their reservations, though—the transient hotel was converted into affordable, green apartments and renamed Harvest Commons in 2013.